It is hard to believe that October is half over! The leaves around here are just starting to turn but we saw some beautiful trees during our recent trip to Minnesota. We even stopped at a place selling pumpkins so Sadie could take a little walk. Yesterday I started working on my newest Island Batik project that I will share for the Pumpkin Fest with the other Island Batik Ambassadors this month. I used the same batiks that I used in my Folk Art Quilted Traditions post. 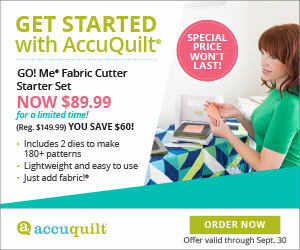 I am also using my AccuQuilt Electric Die cutter and a few dies. I think the first AccuQuilt die I ever bought was the Fall Medley die. This die also cuts a oak leaf and acorn. It is hard to believe that it was 5 years ago when I made my first table topper tutorial with that die! I also did a table topper with just the pumpkins! We stopped at lots of parks….actually more parks than quilt stores! Of course we had to take pictures of little Sadie with the fall leaves. Sadie is a wonderful traveler, we had her bed in the back and she would sleep most of the time. Our trip to Minnesota was to spend time with Builder Bob’s mom on her 96th birthday, doesn’t she look beautiful! There was a big family reunion on her 90th birthday and she said she didn’t want another big party until her…..100th! I like the way she thinks. Her little dog Mandy passed away a couple years ago and she really misses her. We hadn’t told her about Sadie and she was really surprised to see her. Sadie was a sweetheart and spent a lot of time sitting in the rocking chair with her. Her place is in a Senior Center and is very nice, she has her own private apartment. Saying goodbye was hard, I think little Sadie got more hugs than either of us. Tomorrow I should be done with my Pumpkin Fest project, then I’ll share it with you! What a lovely post! Sadie is definitely photogenic, and I enjoyed meeting your MIL. So neat to see her enjoying your visit and especially Sadie. Wow – Your MIL is a beautiful woman. It’s so sweet to see her enjoying Sadie’s visit. Loved the photos Connie! What a lovely Fall trip, and special time to spend with Builder Bob’s Mom. Agree with the rest of the comments. I can only hope to look that great at 96! What a special lady. Fall is almost over here. We had our first big front last night. Good think I covered my flowers, it will give them another few days to bloom! Thanks for all your fabulous designs and patterns you share with us! Connie, you and Builder Bob are so blessed to have his mom, who at 96 looks at least 12 years younger. I never would have guessed her to be closing in on the century mark. My dad made it to 104 and hope she passes him up. Loved seeing the picture of you all. Such a good looking family! Happy Birthday to Builder Bob’s Mom !! Beautiful Lady, wishing you many more!! Little Sadie is so cute and looks like a perfect traveler. Loved seeing her in the chair with Bob’s mom. She looks beautiful. I love her attitude to her birthday parties too! Those fabric choices are perfect for your fall project. Looking forward to seeing it. Lovely post. Sadie is just precious. Beautiful fall leaves, both in the tress and in your die cuts! Connie, what a beautiful post this is! I think so many bloggers shy away from sharing their real lives, but we all have them. Your Sadie is a sweetheart, and looks like a good little traveler. I’m so glad you got to spend time with BB’s mom, and the look on her face with Sadie says she enjoyed her as much as you all do, Happy October to you and yours, and I’ll be back to check out your IB fall hop. Thanks again for sharing. We should all hope to look that great at 96! I’m sure the dog brought her lots of enjoyment during your visit. Such nice photos of you and Builder Bob too!